Christmas in Japan means Santa Claus and Christmas tree-themed everything, Christmas music blasting everywhere from November, and on the day itself, KFC and “Christmas cake.” It’s mostly a romantic holiday for couples, a fun time for kids, and a massive shopping season for everyone, leading up to New Year’s, which is the main holiday of the season (and the year). “It’s a question that many Westerners ask every year around this time, when the iconic red, white and green marketing campaigns go up across the nation: How did Christmas in Japan become synonymous with a fast food joint?” Essentially, it’s due to an extremely successful marketing campaign in the 70s. Read the blog post for more details. KFC is indeed enormously popular for Christmas lunches and dinners, and it’s necessary to order your fried chicken well in advance. We skip the KFC craziness, but we do tend to partake in “Christmas cake.” According to this NPR article, Christmas cake became a tradition in post-war times, where American-style cake came to be associated with a decadent American Christmas. 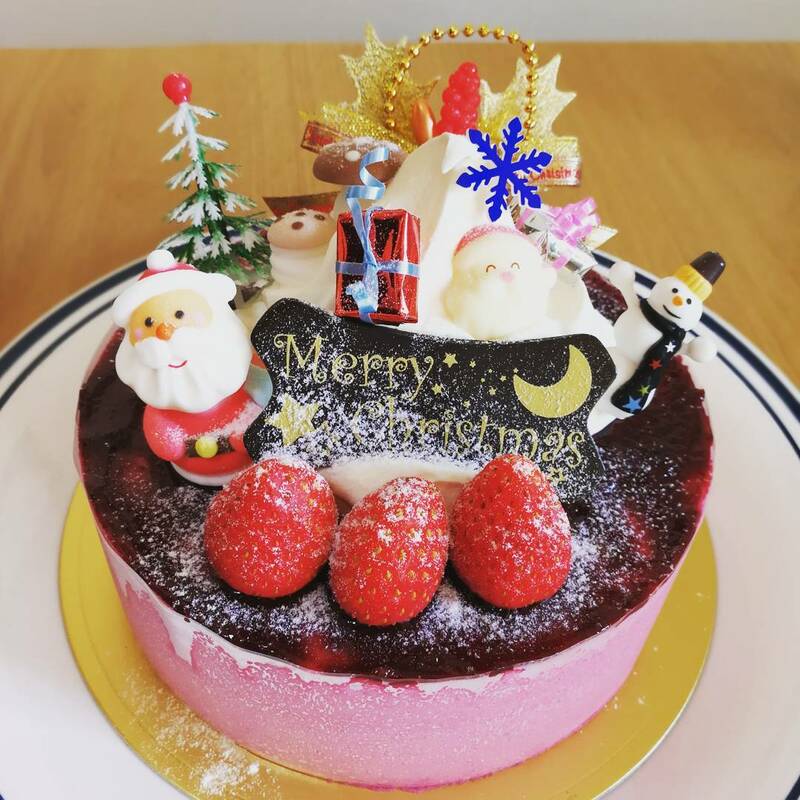 Japanese Christmas cake is typically white sponge cake with white icing and decorated with strawberries and the like, plus various Santa and winter-themed decorations. But there are many different variations, including our raspberry mouse shown below. See also last year’s chocolate. Christmas cakes aren’t just sold in bakeries, but also supermarkets, department stores, and even convenience stores. But in most cases, pre-ordering is absolutely essential! Most Japanese I’ve spoken with assume that fried chicken and cake is typical Christmas fare in America and other Western countries and are surprised when I tell them, well, it’s not! 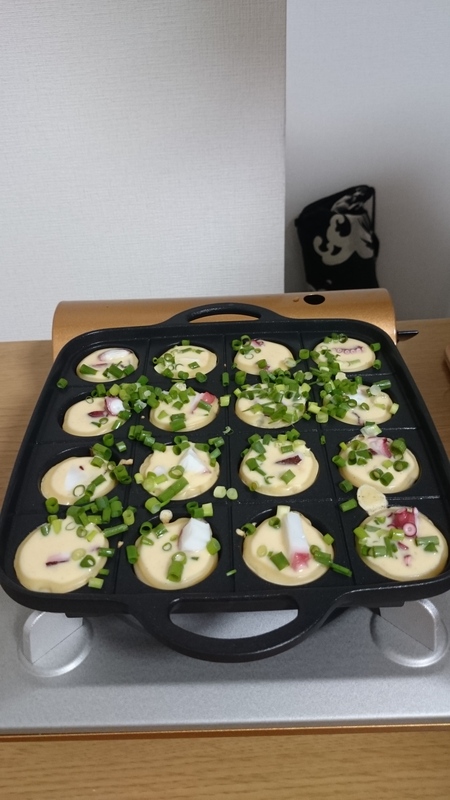 Takoyaki is a much-beloved Japanese food, particularly enjoyed at summer festivals and most famous in Osaka. It consists of a piece of octopus surrounded by a pancakey batter that’s formed into a ball shape while grilled. 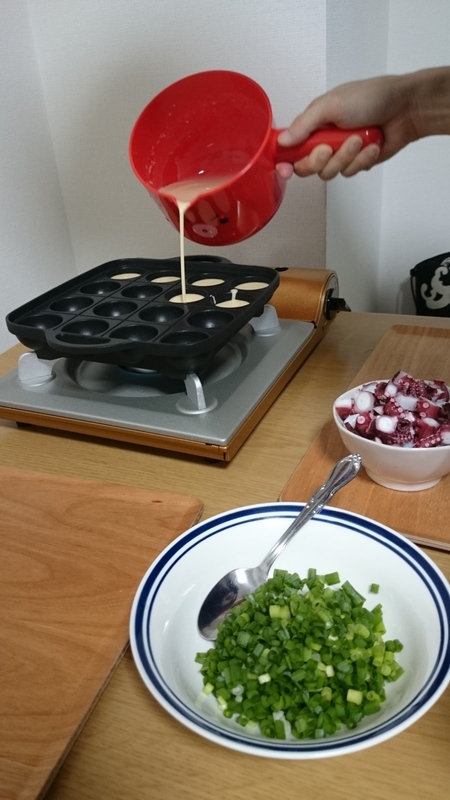 Hubby came across (and bought) a make-your-own kit for enjoying the joys of takoyaki at home. 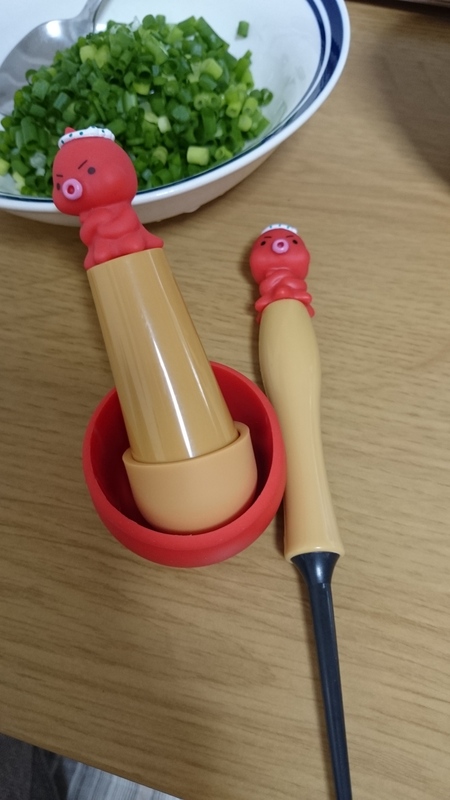 The kit came with all the necessary tools: a bucket for mixing and pouring the batter, a whisk, a turner, a tool for spreading oil in the pan, and most importantly, the takoyaki pan that’s designed for grilling perfectly formed balls. 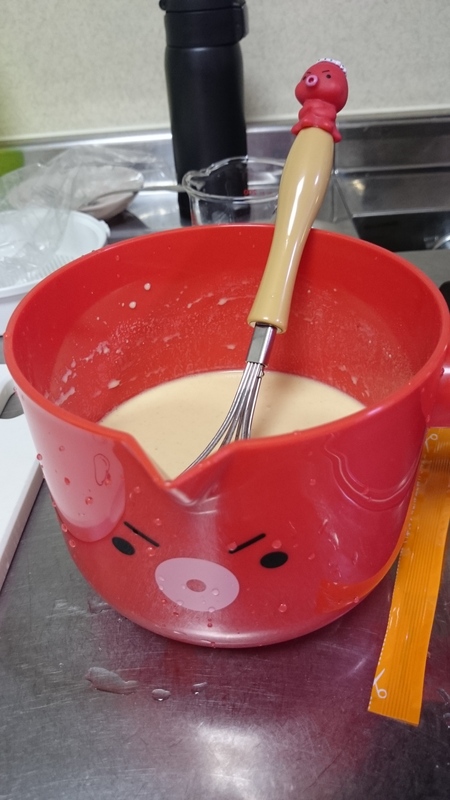 The batter consists of flour, eggs, water, and soy sauce and/or dashi. Oil is spreading into each of the holes in the pan, and then a piece of octopus is placed in each. The batter is poured in, and then green onions added. Usually pickled ginger is also added here, but we didn’t have any. 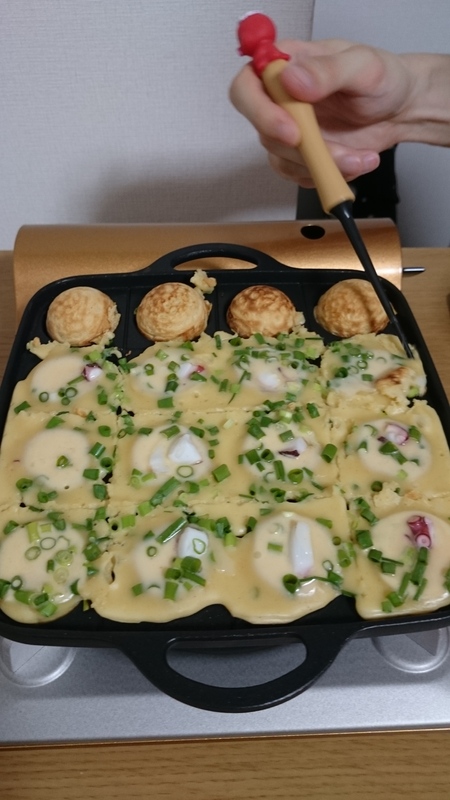 The exciting part comes when it’s time to turn the takoyaki and form the batter into balls while it’s being grilled. 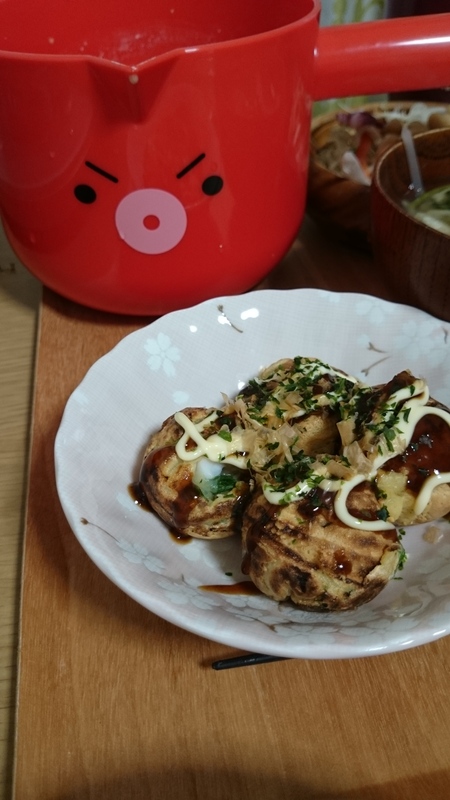 Takoyaki is typically dressed with takoyaki sauce (similar, or the same?, as okonomi sauce), mayonnaise, bonito flakes, and powdered nori. Takoyaki professionals have amazing turning technique. Mesmerizing! Since I’m aiming to become a translator someday, I’m interested in cases of translation gone wrong. My eye went to the English bit, and needless to say, I was confused. However, my friend and I both had coats with hoods, so I figured we were ok.
Later, upon consulting the Japanese, I realized the source of the confusion: フードコート. Japanese doesn’t have the sound “hoo”, or rather the single sound “foo” as in Fuji is somewhere between how “foo” and “hoo” are pronounced in English. For any linguists out there, the relevant phoneme in Japanese ɸɯ, and English fu and hu don’t exist. Also, when English words are represented in Japanese, American/Irish/etc. hard “r”s are often omitted. So car is written in a way that makes it pronounced kah, party is pah-ty, etc. 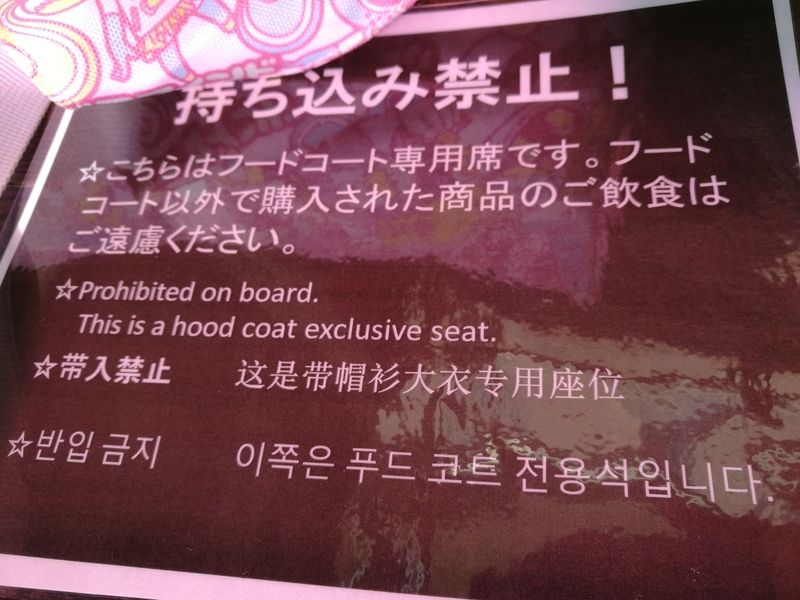 So, it turns out that both hood coat and food court can be transliterated as フードコート (f/hoodo cohto). Ah ha. So the seats were reserved for people eating food purchased at the shops’ food court. No outside food allowed. I’m still a bit confused by the “prohibited on board” wording, but my guess is that the phrase was copied from some other setting where food or something else is prohibited on some mode of transportation. Regardless, it gave us a little giggle. Alas, I can’t comment on the accuracy of the Chinese and Korean translations. 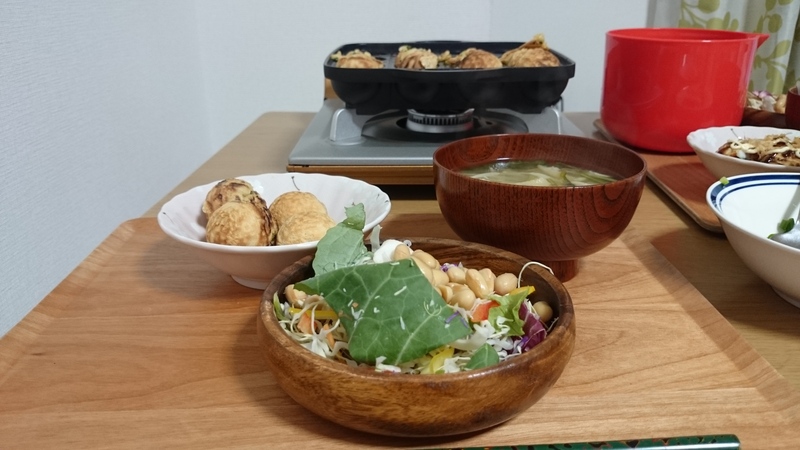 Did you know that you can make 焼きいも (yaki-imo)—roasted sweet potato—in a rice cooker? I put in a couple of centimeters of water and used the quick (30 minute) rice setting. It came out with a perfect texture.